Sealers are hugely beneficial in protecting your investment in stone and tile surfaces. However if sealers are applied incorrectly they can create a range of issues that end up making the tiles harder to clean instead of easier! Removing sealer marks is also virtually impossible without expert help. Penetrating sealers are designed to sit inside the surface of the stone, reducing absorbency and making the stone less likely to stain and easier to clean. If too much sealer is applied, or excess sealer is not removed the sealer can sit on the surface of the stone leaving a milky residue. Slique can remove this sealer residue and correctly apply a new penetrating sealer to protect your surface. Surface sealers (sometimes called topical coatings) are designed to sit on the surface of the stone, generally adding shine and making the surface smoother. We often see surface coatings that are not well applied, leaving application marks (generally swirls). Slique can strip any surface sealer to get the stone back to a clean condition, and apply a new coating. Enhancing sealers (or wet look sealers) are designed to protect surfaces while enhancing the colour of the stone, often referred to as wet look sealers. Unfortunately this type of sealer is the most difficult to apply and tends to have the most issues. Enhancing sealers are designed to sit inside the surface of the stone, but often cure on the surface leaving an oily residue that is very hard to remove and easily picks up dust and grime. Where sealer marks are a problem, Slique can strip enhancing sealer residues and apply a new enhancing sealer to protect while giving the wet look effect desired. To contact Slique about removing sealer marks call 0800 754 783 or fill in the enquiry form at the bottom of this page. 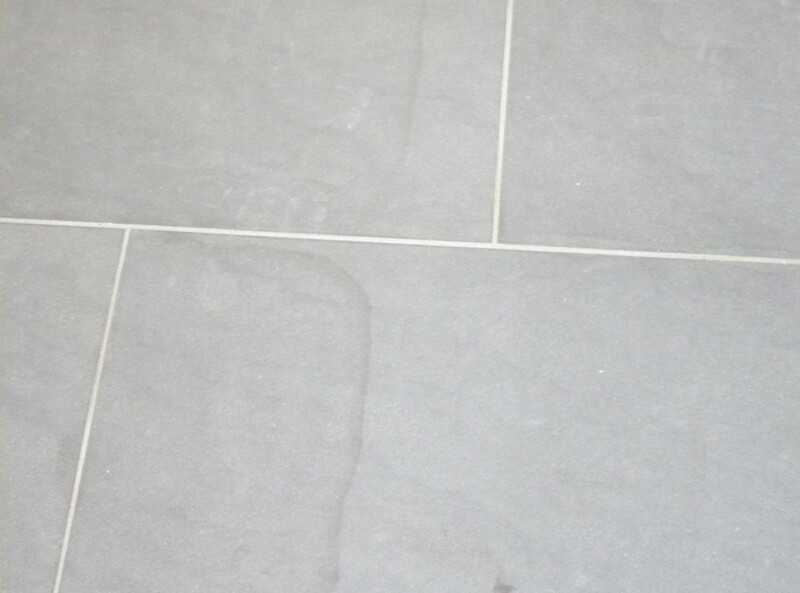 Sealer marks are visible on the left-hand side of these tiles. Removing sealer marks requires the stripping services of a tile cleaning expert such as Slique.